When iPads first came out the thought of our kids grabbing our iPads and dropping them, such an expensive piece of electronics, left us in fear. However, as the iPad has evolved, their use in schools and at home has become generally accepted. Still, we are talking about an expensive piece of hardware, and no matter how well intentioned, or careful our kids try to be, accidents do happen. Kensington has designed the SafeGrip case for kids with just this situation in mind. The SafeGrip is made of a thick foam-like material that covers the entire iPad, except the screen and a square window in the back. This square cut out can be used to personalize the unit in multi-unit environments. It does come with a screen protector as well. “Designed for kids” means a big, thick, handle to prevent drops (doubles as a stand), easily cleans up with soap and water, and even has a slot for a stylus. Since my kids are all grown up, I asked a co-worker, Marc Pessotti, who has two young children, if he wouldn’t mind taking the SafeGrip out for a spin. 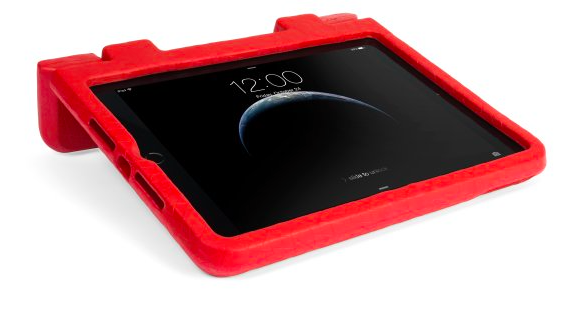 The Kensington SafeGrip Case for the iPad Air 2 definitely exceeded my expectations. 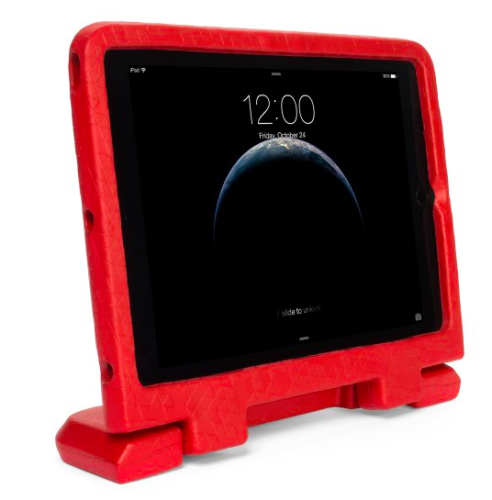 The case is made of a light weight foam that makes it easy to hold and did not slip off any surface I laid it down on. 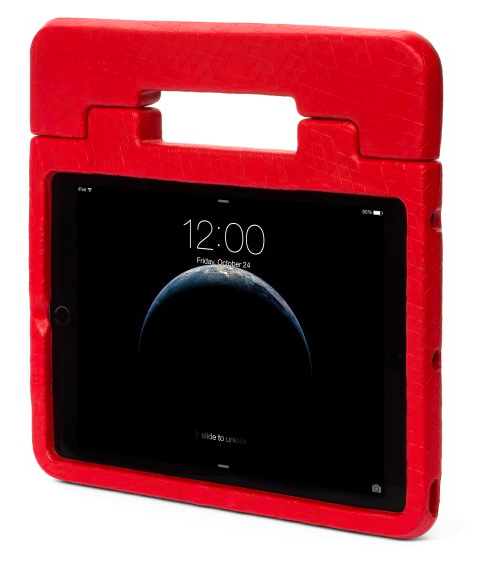 The case holds my iPad Air 2 firmly and the edges are well protected. The case also comes with a screen protector and visual step by step instructions to install it. I have had cases made from similar material for my iPhone 5 and those cases did not hold up well after a couple months of use. The light weight foam material began to stretch and become deformed, blocking the ports on my iPhone. With the SafeGrip Case this did not happen, and the case is still functioning well after a couple of months of use. This case is much thicker than your typical hard plastic cases and I was concerned about port accessibility. As it turns out, I was surprised and impressed with how easy it was to access everything from the volume buttons to the headphone plug. The handle also acts as a stand for the iPad and is definitely useful, but not the most sturdy of stands. If the surface is not flat and solid, you won’t have much luck keeping the iPad upright. Being used by my 5 year old daughter, the case did get a bit dirty at times. Also, the case is easy to write on with markers and pens, but a damp cloth with just water will remove most things, including ink, fairly easy. This case has held up well for over 2 months, but I am still skeptical of it lasting much more than 6 months. With all things said, I give this an 8 out of 10. The Kensington SafeGrip is available at Amazon and directly from the good folks at Kensington.